Laboratory Instruments: What is the BioNeb System? Cell disruption refers to one of several techniques used to obtain biological molecules of interest from within a cell. 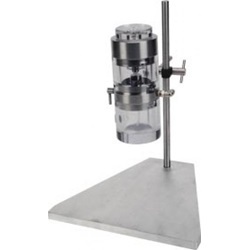 The oldest method is dated to the 1940s and the introduction of the French press, a novel laboratory instrument that induced high pressure within a sample cylinder using a hydraulic piston. These pressures forced cells through a narrow aperture, disrupting cell walls and plasma membranes to support isolation of nuclei, proteins, and other microorganisms. This technique was extraordinary for its time but is severely limited compared to 21st Century laboratory instruments. Breaking apart living cells to isolate specific microscopic analytes remains a key process in a broad range of biochemical and life science applications. Performing this at scale and to new levels of both accuracy and reliability required cutting-edge laboratory instruments operating on entirely new fragmentation principles. The BioNeb® Cell Disruption System was engineered to meet these modern requirements to reach new levels of control for cell nebulization. Whereas the French press used physical induction of pressure to break apart cell structures, BioNeb® laboratory instruments operate on the principle of nebulization. An analytical nebulizer uses tight regulation of gas pressures from 10 – 250 psi to reduce a liquid medium to a very fine mist. Cells suspended in the liquid medium are forcefully distributed into the secondary droplet which creates a microcapillary channel with a laminar flow exhibiting sufficient shear force to break apart a cell structure. Shearing forces are dependent on three primary factors: gas pressures; gas compositions; liquid medium viscosity. It is possible to finely tune the shearing forces generated by manipulating these parameters. For example, increased medium viscosity typically results in a higher percentage of cell breaking at lower pressure operation. BioNeb® laboratory instruments are subsequently capable of nebulization shearing of significantly varied values. Cells can be gently opened or totally disrupted in just three passes. It is also possible to achieve as much as 90% disruption of numerous cell types in a single pass. This is a highly efficient process with flow rates of 30 ml/minute and negative heat generation. Glas-Col provides comprehensive solutions for cell disruption techniques in a range of applications, including life sciences and biochemistry. We offer three distinct BioNeb® laboratory instruments with reservoir chambers of 5 – 30 ml sample volumes and a proprietary regulator for double-stage control of the gas pressure parameters. If you would like any more information about the laboratory instruments available from Glas-Col, please do not hesitate to contact us.